Still touring through that week 1 of the Tour de France! We DVR the race, and I watch after work. Cooking dinner is taking a beating but I’ve been posting my pictures on Ravelry, daily! Day 3’s collage was an entry for Team Spindlers’ prize – you show date/ time proof of a day’s progress. I used the Globe & Mail’s Life section. The Go Outside & Play headline was sage advice. At the end of the Mûr-de-Bretagne climb, I was nicely into the yellows in the skein, and took a second picture. It’s been fun finding new poses to strike with the same project, and the weather has been co-operating. On Day 5 my copy of Fleece & Fiber Sourcebook made its appearance. There was some reading followed by catch-up spinning. Day 6 was brilliant. I had just enough time to finish the run of yellow spinning, and to wind-off into the plying ball. All part of the plan to spin the cleared spindles last night at the LYS. See the little 3 on the do-not-unravel-tape? To signify the 3rd set of finished singles for my friend, Teresa! Which brings me to yesterday, Day 7. Not much on the spindles but I went straight to Spun after work for knit night. Not long after I got there, a family came in with 2 little girls. They were non-knitters buying a gift for Grandma. The younger daughter was adorable – she fought through hiccups, and asked a ton of questions. So, I got to show spinning to the youngest person yet. Her eyes just lit up when she touched the fibre! Shown with beebalm in the last seconds of the day. 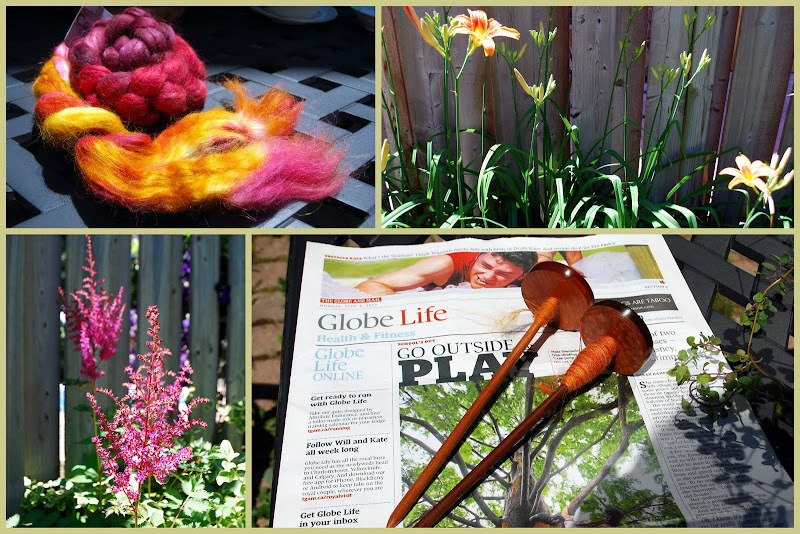 Also making their garden début are the daylilies that my knitting friend, Susie, gave us last summer. They had been out of the ground for a good week before I could collect them, so I’m sure Susie will be glad to see that they did well after planting that day. The lighter orange plants are smart survivors. They missed having a Darwin award by spreading through the fence to our side. All originals were up-rooted by the new neighbours. Who have been heard to crow that putting in the god-awful house-t0-fence concrete was the “best thing” they’ve done. My reply was to dryly say, “To each their own,” without adding a single adjective. The wild survivors now have company – yellow hybrids & Susie’s deep orange gifts. 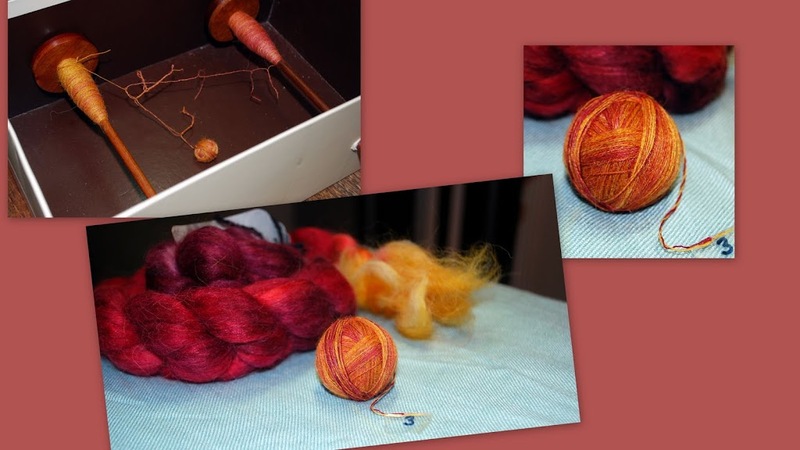 Categories: Spinning, Tour de Fleece | Tags: Books, drop spindle, Flora, Ravelry, socializing, Spinning | Permalink.